Jia Zhang-ke, the foremost chronicler of modern Chinese life, makes remarkable movies that are less daunting--and far more entertaining--than casual observers might think. 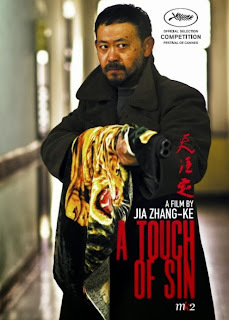 Certainly Jia’s A TOUCH OF SIN is the director’s most accessible, audience-friendly film to date. The omnibus, everything-is-connected structure seems indebted to Alejandro Gonzalez Inarritu (BABEL, AMORES PERROS), yet SIN is actually closer to the fiction of American novelist/short story writer Joyce Carol Oates. Split into four chapters, A TOUCH OF SIN may seem a tad less subtle than previous Jia films like PLATFORM and UNKNOWN PLEASURES. Of course, there’s nothing particularly subtle about violence, and SIN is riddled with terrifying scenes of extreme brutality. It’s the closest Jia has ever come to making a pure “genre” film (The influence of Martin Scorsese is strongly suggested in the movie’s first two segments). As usual, Jia’s camera remains largely impassive throughout, taking it all in like it was breathing air. The most affecting narrative thread involves Dahai (a sensational Jiang Wu) who’s sort of a cross between TAXI DRIVER’s Travis Bickle and the holy fool protagonist of Ibsen’s AN ENEMY OF THE PEOPLE. Dahai arrives in a small northern town determined to make the village chief and local boss accountable for their actions/crimes – they’ve made a fortune selling supposed “collective” property. Like Dr. Stockmann in the Ibsen play, Dahai soon discovers that no one wants to hear the truth. After a series of charged, increasingly volatile encounters with the locals, Dahai goes postal vis-a-vis Scorsese and (Robert) DeNiro’s iconic Vietnam vet. The concluding section, largely set in a very strange nightclub that dually functions as a de facto whorehouse for high-roller tourists, could have been a missing narrative link from Jia’s THE WORLD. Jia deserves to be more widely known--and a lot more widely seen. Don’t miss a chance to catch one of the finest films of 2013 by one of the leading lights in contemporary cinema. 4 out of 4 stars.